TEST 1: - Stock, upper and lower ball joints. TEST 4:.5" taller upper AND lower ball joints. Tall Lower Ball Joints can be added as well for best camber curve, but it will be mandatory to correct bumpsteer. No other modifications are required, direct bolt-in mod, I found no binding. I will add more analysis as I get it done, but I wanted to share this data right away. 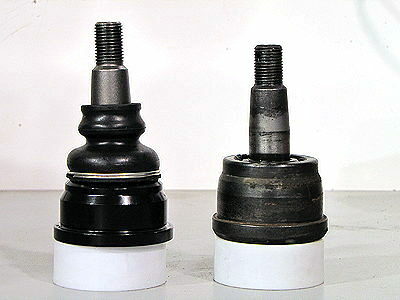 Tall ball joints can be used to increase negative camber gain when cornering, this helps keep the tires flat on the pavement, greatly improving handling with no cutting or modifiction of the subframe. The .5" taller upper ball joint delivers the most bang for the buck, with less toe change impacts. The .5"taller lower gives you some extra bump travel but no camber benefits and causes greater bump steer. I intend to do some software roll center analysis at a later date, but my previous modeling of .5" tall upper ball joints shows there is no downside to using them. Toe measurments are normalized for a 26" tall tire, readings are for one wheel only. Notice that at -2.5" of bump travel, stock Test 1 has .261" toe out, and with .5" taller upper balljoints in Test 2 it goes to .306", double this for total toe across both wheels and it's .612" toe out! Excessive toe out will cause the car to dart left to right under hard braking, and makes the car tend to steer away from where you point it. Toe out in bump can be corrected by lowering the outer tie rod end. I saw no binding of the balljoints while doing this test. The .5" tall upper ball joints cause the least increase in bumpsteer along with a nice improvement in negative camber gain, they are stronger than stock ball joints with better materials than OEM or Moog parts. Dirt is a big wear factor and Proforged LLC has their background in off-road racing. Their high-quality protective rubber boots used are retained by wire retainers on each end, and will do a much better job of keeping dirt out, and grease in. 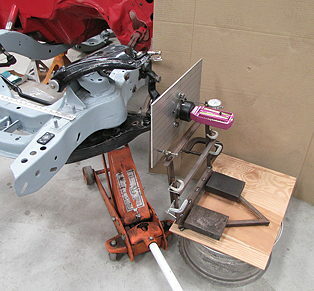 69 CAMARO WITH STOCK SPINDLE AND A ARMS, - SPINDLE IS 4" HIGHER THAN LOWER INNER A ARM PIVOT ON SUBFRAME AT "0" HEIGHT ON CHARTS. THIS IS A FAIRLY LOW STARTING POINT FOR A StOCK CAMARO BUT MORE TYPICAL OF A PRO TOURING RIDE HEIGHT. LOWER A ARM INNER BOLT 8.25" FROM GROUND, WHEEL CENTER TO GROUND 12.25".